The Boskara Bugs outnumber humanity, but not by much. And they have just one colony. Their economy is essentially the same as Olympia’s. Gaahhh! The senior officers of the Navy collectively soil themselves. After commanding a hapless orderly to clean up the mess, the senior officers make a beeline to the Senate chambers to demand a massive military buildup. These bugs are nasty, mean, they hate humans, and they’re ugly too. 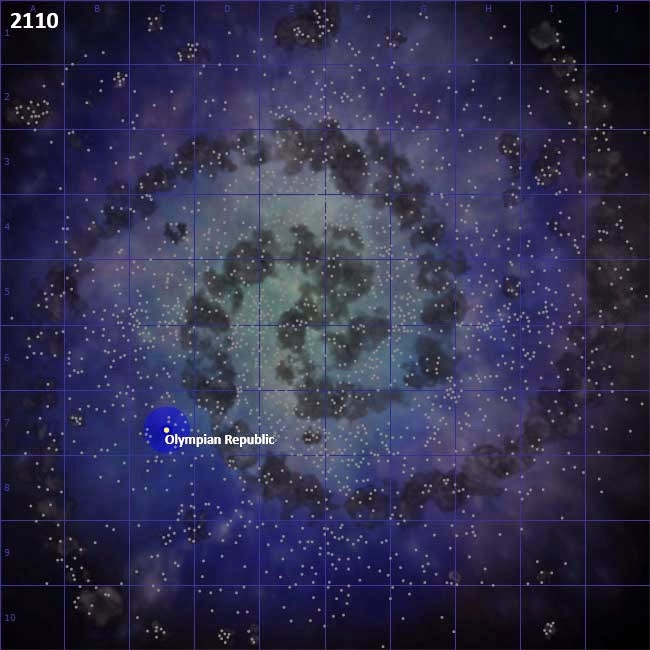 2110.01.12 The Olympian agent Dak Tarfan succeeds in stealing the territory map of Savage Exports and learns of an independent colony in the Upsilon Vulpeculae system--which was already marked for exploration. 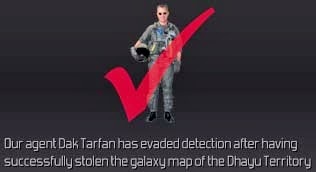 Because of the military threat of the Boskara, Agent Tarfan is ordered to steal the territory map of the Boskara Conformity. 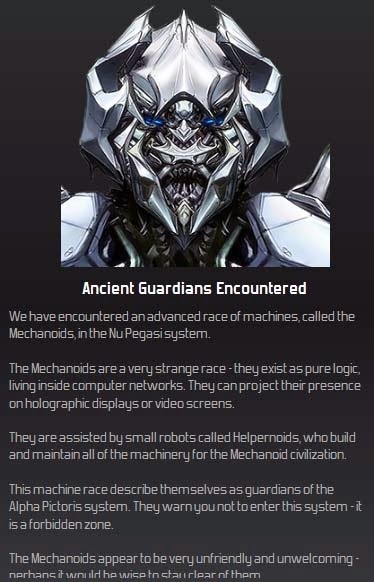 2110.05.26 Exploration vessel EX-02 discovers a race of Mechanoid beings known as the Ancient Guardians. They do not appear friendly...and they warn the Olympian Republic to stay out of the Alpha Pictoris system. By now most of the Exploration vessels are low on fuel and set a course for home to refuel, except for the newly constructed EX-05, which is heading towards the Upsilon Vulpeculae system to make contact with the human colony there. The Ancient Guardians give a warning. 2111.01.01 The Senate has been arguing for months. Despite the supposed “threat”, argues one side, there has been no sign at all of alien aggression. The Ancient Guardians just warned us about alien aggression, argues the other. There are hostile aliens all over the place, and intelligence doesn’t even know where the aliens live. The Navy is desperate for more ships, and also are demanding that new technologies be researched immediately--Shields and more advanced Hyperdrive. Without them, they argue, the Navy cannot fulfill its mission of protecting Olympia. The debates continue...and time passes. It turns out that the Boskara Conformity is two sectors away, giving the Olympian Republic a little breathing space. This, naturally, is used by the anti-military Senators to delay building a Navy even longer. 2111.02.07 Research into Corvidian Shields is complete. This is good news, but with no ships on order to install them, the Navy is still very nervous. 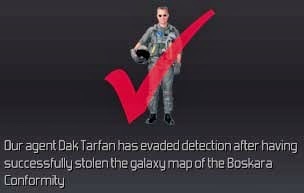 2112.04.11 Agent Tarfan gets the Boskaran galaxy map, which provides some useful information, but nothing major. He is then sent to a gather information from a recently identified empire, the Dhayu Territory. 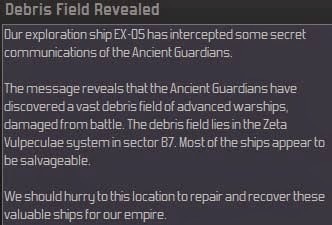 2112.05.18 Exploration ship EX-05 intercepts some interesting information. Certainly interesting yes, but awfully far away for Olympia’s puny hyper-technology. Cataloged for later study. 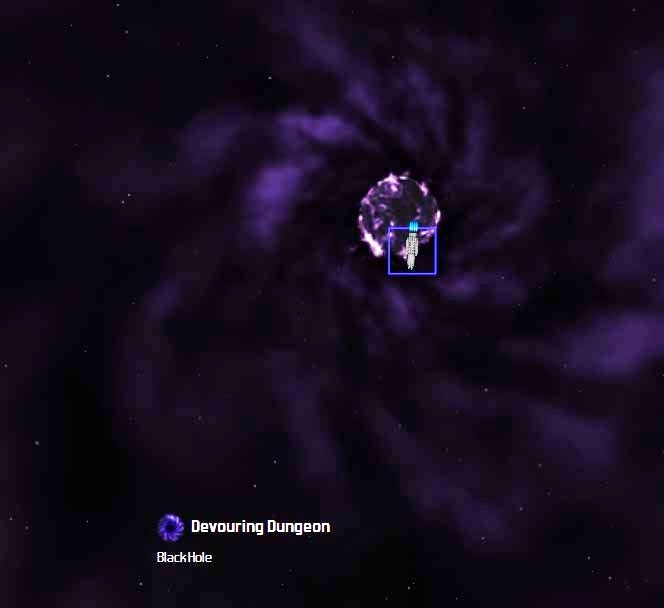 2112.09.04 The Black Hole Devouring Dungeon is apparently a sight to see, and the people were clamoring for a Resort there. A construction ship, Sol Starway, was sent there to build the station, and given extremely strict instructions to keep a safe distance. Yet apparently the Black Hole was irresistible, and Sol Starway ventured too close, and … sigh. Perhaps the next captain will be more careful. 2112.11.10 The Haunted Prowlers put Olympia in contact with another alien empire for only 2,000 credits, the Kiadian Federation. Unlike the Boskarans and the Dhayu, they seem like they may become an ally someday. Good news for an otherwise scary galaxy. 2113.04.22 Good job, Agent Tarfan. Holy crap. Things just got complicated in a hurry! 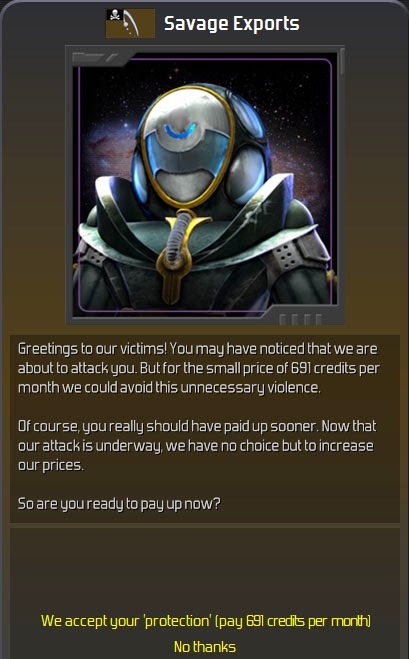 This probably explains why Agent Tarfan had that smirk after he delivered the Dhayu Galaxy map. 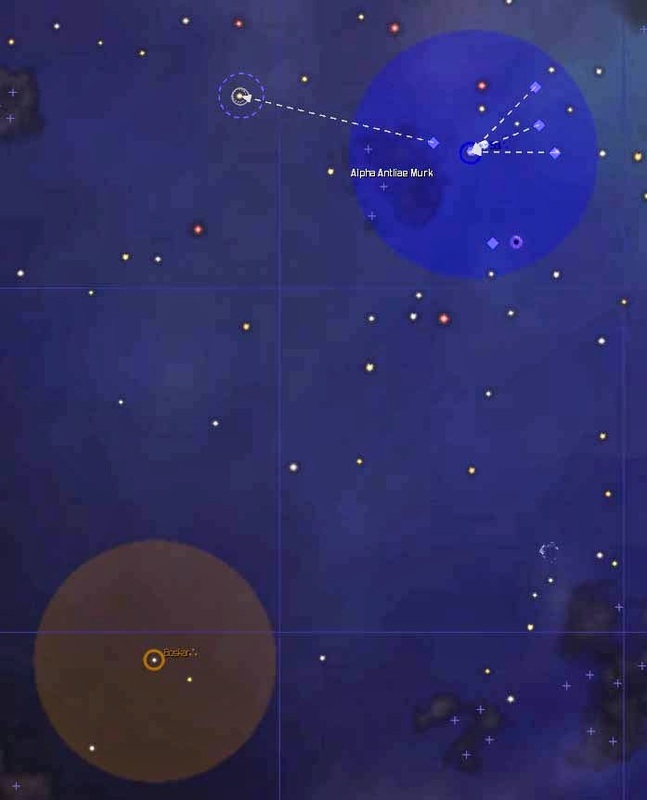 Olympia also has the locations of dozens of pirate bases and detailed maps of hundreds of star systems. There is also information as to the location of over a dozen colonizable worlds, some of which are relatively close, and some that are simply too far away. All this information will take a long time to digest. 2113.05.10 Still reluctant to build up the navy until hyperdrive is complete, the Senate agrees to upgrade the Olympia Space Port. They cannot deny that with some many alien empires, trade will increase, and Olympia will need to be ready for it. Agent Tarfan is tasked to steal Starfighter technology from the Dhayu Territory. 2114.04.05 It has been a long journey, but scout EX-05 has arrived at the Upsilon Vulpeculae system, and moves to make contact with the human colony there. Contact goes well, and makes colonization even more of an imperative. Hyperdrive tech is at 39%, Colonization Tech at 94%. 2114.05.21 The abandoned destroyer in the Sol system is repaired and brought under control. By itself it has more firepower than the rest of the navy. The ship is returned to Olympia Space Port for study. It will not be retired until there are more ships to replace it. 2114.06.15 Agent Tarfan has successfully stolen research from the Dhayu. Good boy. Now go steal some more. 2114.09.02 Savage Exports decide to get “serious”. They threaten to attack EX-05 unless Olympia pays, and do so once they are rebuffed, but EX-05 escapes unscathed. 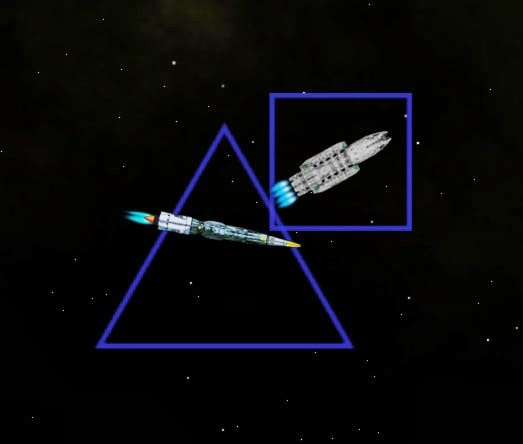 EX-05 is perilously low on fuel, however, and so it requests to travel to the Dhayu Territory to refuel. It will be a long mission, and potentially dangerous, but may gain valuable intelligence. The mission is approved. 2114.09.08 The Kiadian Federation offers the Olympian Repubilc a Free Trade Agreement, which is accepted. Olympia needs allies.